DoWoo - A 365 Day Realignment Journey - I Do Woo; Do U? I’ve been pondering this question over the last few weeks: Are people being fake or authentic? This morning I remind myself these descriptors are labels and labels are a result of having an opinion. An opinion is a judgment and judgments can be toxic, both to the person I’m interacting with and to me. Over 3 years ago I caught myself with similar thoughts and chose to blog daily. The objective: by recording my observations without opinions I would realign myself and how I interact with others thereby creating a more peaceful human experience. During a stint of over 400 days, where I contemplated and wrote nightly on the subject, I found I was able to be kinder to others and ultimately towards myself. What someone else did or did not do, said or did not say, reacted to or otherwise, was not my world – it was theirs. We all have a choice. An observation is an irrefutable fact – no matter who looks at it, it has the same results. Everything else, all the opinions on top of the fact, are superfluous. The thing with this human experience we are having, the lesson keeps expanding until fully accepted. If I don’t get it the first time around, the next time it becomes more challenging until eventually, it may have to be a serious slap in the face. I recognize having lost track of the alignment benefits of having reviewed my day every evening, asking myself what did I observe, whether I had opinions, how could I reframe any opinions I may have had. The lesson I need to revisit/embrace is allowing others to be what they need to be without any expectations. There is no fake or authentic. There is only their reality and mine. No opinion. Observe. Allow. Move on. For an explanation of observations versus opinions please click here. This entry was posted in Dowoo on January 14, 2018 by Carolynn Sokil - I Do Woo; Do U?. Take your own advice I said to myself – LOL! Apparently, this is a reoccurring theme which has been building in intensity…since I’ve not taken it yet. It’s time I truly started taking my own advice! This is how my night started to unfold as of about 11 pm. It’s now after 2 am and I’m trying to make sense of the multitude of thoughts bouncing voraciously inside my skull; the myriad of emotions flowing sporadically within me. I’m not even sure how to label the rest. I recognize these as being somewhat defeatist in nature. I am not in any mortal danger at this exact moment. I must live in the now, yesterday, and tomorrow do not exist – only now. Hence why I am writing. Writing has always helped me clear my mind. Solidify my perception. No need to dwell on why I stopped…am rejoicing and being grateful I am doing it now. Having picked up Deepak Chopra’s “Seven Spiritual Laws of Success” last night, opening it randomly to find the description of the first of three parts to the “Law of Least Effort” I was reminded of all the lessons, tried tested and true, which I have studied and coached others on. So where are these lessons now? I’ve always found it easier to share my advice with others than to take action myself. Back to that now I mentioned. So, I ask myself (quite seriously) what advise would I give someone else who is in a similar space to me?? Take 10 deep breaths – long in and long out. Now! Ask yourself whether there is anything you can do right this moment, at this exact time in space, to deal with whatever is going on? If so, do it. If not, allow now to be as it is. Make a plan to work towards resolution of what’s been going on and consider any contingencies. Ask yourself what would be the worst thing which could happen – and map out a plan to deal with that scenario. Then let it all go…other than the things you need to do right this moment – in the now – to move the resolution forward. Take 10 more deep breaths – you’ve got this! Give yourself a pat on the back – Remind yourself you are strong and capable and limitless in what you can accomplish both mentally, physically and emotionally. Choose your allies wisely. Now is precious. You’ll never get this moment back. Think about who supports you and keep them close. Distance yourself from anyone who may enable a defeatist attitude. Embrace those who cheer you on and those who can help you to accomplish your task. Realize everything you have done up till now has created this moment. This moment, once over, will join the chain of moments which create your future. Treat this moment, this now, carefully – making sure it is all it can be. Stop…and I mean STOP filling your time with mindless chatter, activities, and actions. If it does not help you to become all that you envision yourself to be, cut it loose. Acknowledge you have everything well in hand. Life unfolds as it is meant to. And if it’s not currently what you thought it should be….well, it is as it is based upon what you’ve done up till now. Since you have a plan for what you want it to look like in the moments which are not yet here…it’s all good. Continue on being your marvelous you! 10 more deep breaths….and now go to sleep. This entry was posted in Dowoo on June 28, 2017 by Carolynn Sokil - I Do Woo; Do U?. Parenthood does not come with any instructions on how to be a great parent nor raise great kids. 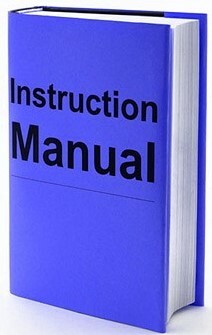 I’ve heard many a parent comment that kids do not come with instruction manuals and wished there were something to help. Some of us carry on with how our parents raised us (whether we mean to or not) and some chose to go to the complete opposite hoping not to repeat what they themselves felt was lacking when they were raised. 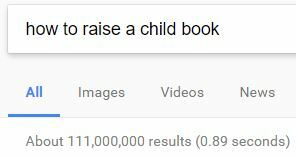 Numerous books have been written on child rearing which results in parents adopting whatever philosophies are shared…only to later find out that whichever technique they were using from the book has now been replaced with a new option, discounting the previous method as being an incorrect or outdated. The essential point we need to remember (from my perspective) is each one of as us as parents, AND each of our children, are unique individuals – we are all different. Therefore how can there be a one-technique-fits-all solution? This is when we as parents choose to ‘do our best’ and hope our children ‘turn out OK’. The recent article below had me recall one of the phrases I used to say to myself when I was going through the earliest stages of parenthood – what I liken to as living with early insanity. Many dreaded the “terrible twos” which we decided was not an option. We took advise from my late father who said they were the “testy twos”. Children get up each day and try to reach something on the counter and eventually they can reach it. They try to pick up something or put something together and eventually they do. They are constantly “testing” their boundaries. So, from their perspective they are meant to test AND this includes all the rules we as parents are attempting to each them. They are not being difficult or terrible – they are just testing. This is where that “lots of love and consistent rules comes in” – being consistent while they test. Walter and I are still raising our son – he’s not quite 12. Together we agreed early on to adopt the attitude this was our train ride and he was along for the ride. We would do our best to make each day count – using lots of love and consistent rules – but it was going to remain our journey. When he is old enough to do his own thing, and wants to hop on a different train ride – well, all the power to him. Until then we would do our best and lead from example. We don’t always succeed and occasionally have to regroup but we figure showing our son that we are fallible – that’s all good! And we are still learning. As soon as we learned how to speak “10-year-old”, he turned 11 and now that we have “11-year-old” just about worked out he’s turning 12. Thus, keeping us all on our toes. I hear teenage-hood is supposed to be rather interesting and many a friend with adult children have shared their horror stories and said “just wait” with a certain tone in their voice most often paired with a set of eyes rolling. We plan to approach this stage of parenthood the same way we did with the “testy twos”. The future vision we have is one of a responsible human being who is gentle, kind, caring and aware. 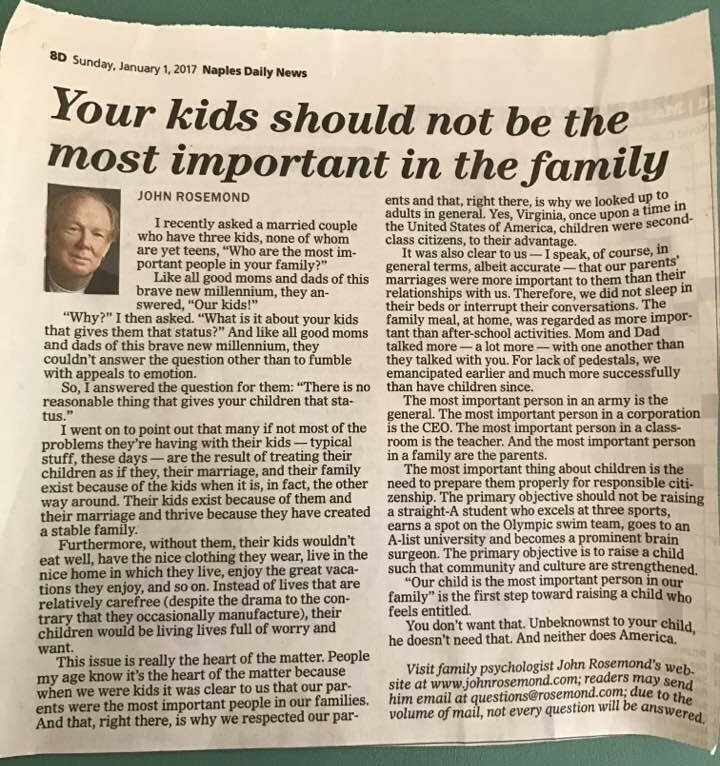 This seems to be in keeping with John Rosemond’s articles “The primary objective is to raise a child such that community and culture are strengthened.” While neither of us are family psychologist we just may be onto something! This entry was posted in Dowoo on March 12, 2017 by Carolynn Sokil - I Do Woo; Do U?. For years I’ve heard this innocuous word “they” – which when used in this phrase appears to represent the “Royal We” of whomever is noted as having the ultimate advice on any given subject at any given moment. What I have observed, mostly through personal trail and error, is “they” are not necessarily the be-and-end-all source of advice. We read books; we are guided by our parents; we go to seminars hosted by ‘gurus’; we are taught by a multitude of learned adults during school; we are preached to by our religious leaders; we interact with our peers and then we hear what “they” have to say. So many entities giving ‘advice’. How do we decipher what is real versus imagined; fact versus fiction; opinion versus observation? THEN once we view this information, through the myriad of coloured glasses we wear, each one of us may end up deciphering the same data with different results. Perspective. I’m someone who has always enjoyed math. Other than in George Orwell’s 1984, 2+2 always equals 4. The square root of 64 always equals 8. In a right angle triangle, the square of the hypotenuse (the side opposite the right angle) is equal to the sum of the squares of the other two sides. It’s irrefutable. I like definitives. I’m someone who strives to live within observation and avoid opinions (please note the operative word here is “strives” – I continue to work on this). I like logic, order and reason. So how then do I make sense of the rest? One option is to ask myself whether the information resonates within. I typically link resonance to being aligned with my truth. But truth can be subjective – based upon one person’s perspective – in this case…mine. And thinking something is true implies the absence of falsehood – which may not actually be the case. If something resonates should it not feel good? But then whether something feels good can also be considered subjective can it not? A massage feels good to me. So too does the warm wind on a beach. However, I know others for whom these things do not feel good. Now, I’m going in circles and am still asking how do I make sense of it all?? This entry was posted in Dowoo on May 16, 2016 by Carolynn Sokil - I Do Woo; Do U?. Yesterday I was assisting a visitor to the area while they were doing a quick shop for staples at the grocery store. The options available included 1 brand of peanut butter and then a choice of either smooth or crunchy. Bread is typically one brand with a few options – but style and type of bread is mostly what some refer to as “air bread”. I commented that one of the things I’ve observed in Costa Rica is there are a limited number of options when looking for something – sometimes there may be only the one option to choose from. From a Canadian perspective I am used to having numerous options to choose from when I go to purchase something for the household. Say I wish to purchase a set of kitchen dishes – I could go to a dozen stores all within a short drive and have 10-30 options in each store. Here you may have a few stores – locally and within the surrounding towns, and if you are lucky a store may have 2 or 3 options to choose from. If I were shopping for curtains there are some stores in Canada which have over 50 options to choose from. Locally there is the 1 store with a few options and another farther away which had about 10 different types – 2 options on the type of rod attachment and a few options of colour with maybe 3 makes for variety. On the other side of things, I have observed, when going to a more densely populated area, there seems to be a lot of options for clothing (the 2 malls I’ve been through in the outskirts of San Jose appeared to be comprised of over 60% clothing stores). Then again, when we were in Uvita we came across a store which had home decor and lights with about 40 choices in table top and floor lamps. Walter surmised for this case it may be to cater to the expat community setting up their homes as there are a large number of new build developments in the area. After my evening ponder, I realized I had been looking at the availability of purchasing options from what I was personally used to – ultimately stating the observation with my opinionated twist. I wonder how many of us do this? I started to look at the situation from another tilt. Is it possible the locals do not require so many options? Could it be the item is not a high demand product so availability should be considered a blessing? I cannot actually comment on their perspective as I am not a local. However, I can attempt to rephrase and remove my opinion. When shopping for housewares in Costa Rica, depending on the item and your location, one may find 1 or a few choices. If I find something close to what I am looking for, I have the opportunity to consider this a blessing, I love deconstructing my words and thoughts. Thanks for tuning in! This entry was posted in Dowoo on January 28, 2016 by Carolynn Sokil - I Do Woo; Do U?. Had an email exchange with someone today. It was sent after a round of emails with a group of people involved in a particular discussion. Each was interpreting based upon their perspective…and unfortunately I felt inclined to participate. First Aha! – What WAS I thinking?? A few minutes after I sent my direct reply I reread what I had wrote and said aloud “She’ll probably take offence to what I said.” Walter responded “Exactly! It’s hers to take.” Second and more important Aha! Deepak Chopra writes in The Law of “Karma” – The Seven Spiritual Laws of Success. “Whether you like it or not, everything that is happening at this moment is a result of the choices you’ve made in the past. unfortunately, a lot of us make choices unconsciously, and therefore we don’t think they are choices – and yet, they are. If I were to insult you, you would most likely make the choice of being offended. If I were to pay you a compliment, you would most likely make the choice of being pleased or flattered. But think about it: it’s still a choice. I could offend you and I could insult you and you could make the choice of not being offended. I could pay you a compliment and you could make the choice of not letting that flatter you either. In other words most of us – even though we are infinite choice-makers – have become bundles of conditioned reflexes that are constantly being triggered by people and circumstances into predictable outcomes of behavior. These conditioned reflexes are like Pavlovian conditioning. Pavlov is famous for demonstrating that if you give a dog something to eat every time you ring a bell, soon the dog starts to salivate when you just ring the bell, because it has associated one stimulus for the other. I did not mean offense by what I said. My response did however include my share (yep…it was an opinion) that one has the option to choose more wisely which battles are to be fought and which ones to let go of. Having lived my entire life challenged by my reactions based upon my conditioning, I now work daily to be aware and to take time to choose how I react. I recognize that by doing so I “allow” more often which then results in a happier space of mind and heart. I truly wish others could be aware of this. It may aid in a more positive and happier place for their mind and heart. This entry was posted in Dowoo on December 14, 2015 by Carolynn Sokil - I Do Woo; Do U?. Over the past year I have been systematically releasing all that I had embraced, all that I understood defined me. Why? December 10th, 2014 I chose to put my foot down (proverbially) and follow my, and my family’s, dream to Costa Rica. Over the next 6 months we sold the house, the mustang convertible, 95% of the possessions we owned and we left Canada. Woo Hoo! I was on my way to living my vision. My vision included an amazing view of the lake – check! My vision included Walter playing piano – check! My vision included teaching our son about living on purpose – check! My vision included spending more quality time with my family – no check because while I was with them more often physically I was not as present as I had intended to be. My vision included painting, being more creative – definitely no check as this part totally got lost in the shuffle. My vision included creating something to teach children all we know – no check! Why was I not living all the aspects of my vision? This leads to a further release of what I understood defined me…. I recently made the decision to move away from a course I’d been totally immersed in for the last few years. The teachings, the logic, the results of this course are phenomenal. I loved the message and the methods. I loved guiding others and watching them find their bliss. So why would I choose to remove myself? In going through this decision making process I realize I had concentrated on external forces which really had nothing to do with the actual teachings of the course. The external included who said what, how it was said, what was implied, what was actually meant, how if felt. While all of these points were certainly valid, and supported my decision to remove myself from the course, why was I still rehashing it all in my mind? 48 hours later I recognized a pattern!!! Prior to heading out on my own as a consultant I had resigned from the last 2 corporations I worked for (1 for 5 years and another for 15). When I thought back to how I felt then and I how felt now…there were definite similarities. I had also concentrated on the external when leaving these positions – who said what, how it was said, what was implied, what was actually meant, how if felt…same stuff repeated. AND guess what? I rehashed it then! It took me years to release those situations fully. What a waste of brain cells! No way do I want this situation to take that long. So…Other than me, what was the common factor? Over the last 2 days I looked within myself and realized I had not been aligned with my purpose. My efforts are supposed to be fulfilling my purpose are they not? But when I looked at these 3 situations I was working alongside others for someone else’s vision and mine got put on hold. Now, it did not start out that way. I would like what was being offered. Enjoyed the product or business and the message. I would start out by being as helpful as I could. Learning as much as I could. I did what was expected of me and more often than not, what was not expected of me – typically exceeding expectations. Taking on more responsibilities was common. I figured my place within the organization, my role, was helping me to fulfill my purpose. THEN…I would get to a point where I started to become dissatisfied. I saw others’ ways of doing things were not in alignment with how I believed it could (and sometimes even ‘should’) be done. I took ownership in my mind…but it was not mine to take. So when I became frustrated I blamed it on the fact we no longer saw eye to eye and I could not understand why they did not see my perspective. Guess what? It was never meant to be my direction for their vision. It was their direction for their vision. So when I started to believe in a different direction for their vision – this is when the discord started. This is when I became dissatisfied. This is when I concentrated on the external BS and allowed it to affect me and how I was living my day. It was not about them. It was about me. By working on someone else’s vision I learned a great deal. I was able to be of service – something which is inherent to my core desires. But by doing all this I also postponing my own vision from developing. I realized this week that I must follow MY vision. I must have solid direction for MY vision. AND I must not waver. I realize these 3 scenarios are like me being that “square peg” and each of these other company’s directions was a different shaped hole. If their “hole” is big enough, my “peg” can typically slide into place, although at no time is it a prefect fit. These different shaped holes are created by and for the person whose vision it is. I realize I must clearly identify my vision and once I do, it will automatically be the same shaped hole as my peg. This is when I will know it is my purpose, my true ‘perfect fit’. It is not their vision which defines me. It is not my actions while working on their vision which defines me. It is not continuing on or moving away from their vision which defines me. Me fulfilling my purpose for being, actually embracing, creating and living my dharma…THIS defines me. So it’s not about who said what and what was said (etc.). It’s not about me not agreeing with someone or them not agreeing with me. What they are doing and how they are doing it is absolutely perfect…for them! So while these discords may have been the catalyst which got me to move on or resign…they are not the true cause. Any disharmony is mine and mine alone as I chose not to remain in alignment with my purpose. Going back to my vision checks. I was not precise in what I wrote. My vision was not solid enough. February 7, 2014 I wrote “In order to teach the valuable lessons to our 8.5 year old son, …Why not create something which could be shared with children”. THIS has not been clearly defined in my written goals. Although I teach all we’ve learned from Deepak, Wayne Dyer and so many other amazing authors…I have not been creating my vision…teaching children. My observations these past few days are of magnificent proportions and I’m grabbing a hold for life, my life! This week I am voluntarily choosing to be alone without electronics for 72 hours. My family drops me off shortly. I am taking my paints, my canvases, my journal and a pen. I am going to spend time allowing my mind to become quiet. I plan to ponder my vision and flesh it out. Look out world…here I come! This entry was posted in Dowoo on December 7, 2015 by Carolynn Sokil - I Do Woo; Do U?. This entry was posted in Dowoo on November 30, 2015 by Carolynn Sokil - I Do Woo; Do U?. After hitting “post” last night on my #400/365 I turned to Walter and informed him I had posted my last DoWoo. He immediately put his hand on his heart and said it hurt. Not only have I been DoWoo-ing this year, but both Gregory and Walter have been invested in my daily observations. I explained I felt I must readjust myself and how I was investing my efforts. I realized I need to reconnect with myself. I felt like there was a shift happening. I could feel it shifting. Then I got to thinking…observing what was going on…. With all the “releasing” of the things from my previous life, there appears to be even more I needed to release. Helping others in ways which are not in-line with my own personal direction has been causing me stress. I like harmony. I needed to right the situation. With this shift, I realized I was hearing the call – the hero’s journey – and I chose to pick up the phone! Hmmm…I never would have associated releasing so many things as being part of the call which allows me to step into the unknown. I would have imagined that it was more about gaining things. I’ve always thought that when someone chooses to take a self development journey, they are typically looking for more. They want to go somewhere – and are aiming for a space. In my case, it’s almost like I am releasing these aspects so I can have the space and clarity to allow what is about to unfold to be available and I need to be receptive to whatever that is. And what that is…is ME! I am about to find out who I am. I am so freakin’ pumped! This entry was posted in Dowoo on October 6, 2015 by Carolynn Sokil - I Do Woo; Do U?. Just over a year ago I made a commitment of “Daily Observations WithOut Opinion” – To “DoWoo” for 365 days. AND…I did it. And some of those observations were fairly eye opening. I made a commitment to blog daily without fail. I did that as well. Through a year when I participated as a Certified Guide in the Master Key course, assisted on a variety of projects within the class, managed my own business, reconnected with my siblings in order to offer assistance to our ailing mother, dealt with her passing and helped Walter through losing his own mother, we’ve sold our house, our convertible, and 95% of the possessions we owned, and moved to another country where they speak a different language…all this while keeping my commitment to myself. I did it! I’ve decided to seriously reevaluate my direction and what I desire out of my life…to find a new focus for my journey of self discovery. I know it includes gratitude…so much gratitude for all that I have learned this year and am about to learn, gratitude for the support and love of so many amazing people along this journey and for all that is about to transpire. Truely grateful! I also know it involves teaching and guiding our son to be the best he can be, with the best way to do this is showing him how I am being the best me I can be. And as I wrote 2 days ago, to “be” I must first concentrate on my thoughts. Concentrate on the power of my mind. I am embarking on a time devoted to myself and my family – with my loving and supportive husband, a man who loves me for everything I am and even for what I am not, and with our precious son who is at a pivotal juncture in his development. We chose this journey to Costa Rica to have a particular quality of life – and that is what I am about to seriously concentrate on. A realignment which concentrates on the positive teachings we embrace and use to guide others. Hasta que nos encontremos de nuevo. ¡Gracias! Until we meet again. Thank you! This entry was posted in Dowoo on October 5, 2015 by Carolynn Sokil - I Do Woo; Do U?. Gregory’s teacher asked him to do a presentation about Canadian holidays / celebrations using PowerPoint. He got into PowerPoint and created pages with all the photos, titles and animation by himself. He then pulled information on each of the 10 holidays / celebrations we chose to highlight and we worked together on his wording in English and the translation to Español. We observed together that what you enter into a translation tool needs to be translated back to English to ensure it still says what you intended. Walter worked with him on his pronunciation. Today I am grateful I got time to spend with my son working on his presentation for school this week. I observed challenges today with having committed to other people’s agendas without a full review on whether these aspects were in line with my agenda. Recognized I must continue to manage my expectations of myself. Am revisiting my list of commitments to realign what are within my capabilities, what are reasonable activities to expand my capabilities and what I am passionate about pursuing. I am confident tomorrow my activities will alter in line with my desires and the challenges I experienced today will dissipate. I am grateful for this realization. This entry was posted in Dowoo on October 4, 2015 by Carolynn Sokil - I Do Woo; Do U?. It has been a wonderful road I chose to take 2 years ago. And now…we are starting a 3rd year together – participating as Master Guides in the Master Key Experience. I can only image being exactly where I am (and that’s a good thing!) I’ve had the pleasure of watching so many people from the same graduating class as me reach the goals they set for themselves…some having exceeded what they thought they were aiming for. I’ve had the honour of guiding some amazing students last year and seeing them soar. What a phenomenal space to be in. We chose to include our son this year. The verbiage needs to be explained but he’s getting the hang of it – especially having listened to us for the last 2 years….and we moved to Costa Rica – so he KNOWS what you think about CAN become your reality. Now we get to help teach him what is within the Master Keys. We were breaking down the week 1 Master Key by Charles Haanel for him – paragraph by paragraph. Paragraph 4: This is true because we must “be” before we can “do”, and we can “do” only to the extent which we “are”, and what we “are” depends upon what we “think”. When we asked him to explain it back to us – he chose someone thinking about being a famous rock star. He got stumped on the ‘are’ and asked us to explain again. We explained that you ‘are’ only what you truly believe – so the stronger your thoughts mixed with true belief allows you to know you ‘are’ this thought. OK – so he then said someone chooses to think they are a famous rock star and then he does all the things, practices what he needs to do, to be the rock star and after he does this then he can be the rock star. Numerous times in my network marketing career I’ve heard people share “Be. Do. Have” as their mantra. The explanation – first you must be the person you wish to be, then you must do the things the person you wish to be should be doing, then and only then will you have the things you wish to have. Pondering this…I believe ‘having’ is irrelevant. It’s about thinking, believing, knowing you are, then doing and then being. AND the key is adding feeling to your thoughts and your beliefs – at the core. When you travel this way, and remove the material stuff (the having) you concentrate on the end result of being who you were meant to be. Being! THIS is your purpose. This is what you get to find within the Master Key Experience. This entry was posted in Dowoo on October 3, 2015 by Carolynn Sokil - I Do Woo; Do U?. Started the day reading Og in bed with Gregory. What a way to start a day! He keeps catching words that he is working on understanding and asking. It’s interesting to break it down to a simplistic way of understanding. The old English within the book was interesting to explain. Am grateful for the opportunity to spend this time with our son – teaching him, guiding him, preparing him for an amazing journey…his life! Barber Walter stepped up to the plate next – using the clippers on Gregory’s hair … and then mine! Am grateful Walter is brave enough to take care of my hair when I’m willing to shave it all off in the heat! Worked through the last of the DMPs which had been submitted, wrapping up the day with 100% submission from the team I’m working with this year. It’s a different feeling than last year, having worked through so many now – the comfort is there. AND the knowledge of the importance of someone else’s dreams…the importance of the written word. Grateful for the experience and most grateful for having been entrusted with such a wonderful opportunity to assist others. While working at my desk, I can see (peripheral vision) if a car goes down our cul-de-sac. There are no other houses past ours. I looked up as they went down and then looked up again as they rolled back down. I waved. I wave and/or smile at everyone here. The driver stopped the car and got out. Walter went out to meet him. Turns out the couple were driving around looking for customers – they sell fresh fish. Opening up the back of the truck they had a cooler the width of the car – fish of all kinds along with fresh jumbo shrimp. We restrained ourselves and purchased only a 1/2 kilo of the shrimp and fish fillets. Mmmm. I am grateful to live in a place where fresh produce arrives at our door unexpectedly. Today was hot with minimal wind. It got up to about 35 degrees Celsius with only 57% humidity. The fans were spinning and I was dripping. Late in the afternoon we could see clouds starting in the distance – darker and then thunder. Eventually the rain came. You could see the steam coming off the stone patio as the rain connected. Walter suggested we go play…so we did. We danced. We hugged. We sang. We ran around. Gregory kicked off his shoes and ran barefoot as the water on the patio was warm – having warmed with the heat from the sun on the rocks. I am grateful for the opportunity to play in the rain and to create this memory with my family. Double power pose! And not only do we have free food (in the trees on the properties and on the side of the road), turns out we also have free shower facilities…. This entry was posted in Dowoo on October 2, 2015 by Carolynn Sokil - I Do Woo; Do U?. One of the things I have struggled with lately is my need for approval. I know that only my opinion of myself matters. I teach our son for him to remain true to himself. I see a lot of myself in him…in how he interacts with others, and his need for approval. Where does this meme stop? The meme stops when I can understand where it starts, what triggers it and then choose a different path, so that I create a new meme which is in keeping with what I know to be true. So…where did it start? Walter and I discussed it and we looked at my family. I remember as a child having either approval from my mother or my father. Rarely did I have both their approvals. I recall bringing home my grade 5 report card – filled with VG (the highest mark you could get) with only 1 G (the next down). My father asked me what happened in the 1 subject to get a G. It was a defining moment…I did not share my report card with him (willingly) again. Then I looked at my siblings. They were all older with my closest siblings, 4, 5.5 and 6.5 years older being mostly a clique and then the oldest from this paired with my brother who is 8 years older and lastly the 2 oldest being mostly on their own – other than they tended to ‘take care’ of my (babysit) while my mother was working. I was the odd one out from a sociability perspective. Now add to this they are all motivated by power – strength and moving things forward. I was a social being – motivated by intimacy – connecting with people around me. So…if I could not connect with them (due to the age differences) I connected with my friends and support circle. But, because I wanted to belong, I still attempted to seek my siblings out….without getting what I desired. I can’t imagine why? I was a complete angel! NOT! I was a bit of a brat when I think about it. As an adult I have always looked for approval – shining when the work place management would pat me on the back and sulk when management did not provide that appreciation. I spent years looking for approval and allowed the environment to dictate my thoughts. Lastly you replace the thought process with a new (healthier) thought process. Working on it! Walter has agreed to assist me. I’ve always admired people who are able to allow things to bounce off them. To be confident in themselves and project this air of total alignment of their actions and thoughts, knowing their self worth, relying only on themselves for approval. I vow to seek this in others so I may educe this in myself. Thank you for being here. This entry was posted in Dowoo on September 30, 2015 by Carolynn Sokil - I Do Woo; Do U?. A day filled with blessings. I got to work with people on fine turning their dreams today. I got to reconnect with some fantastic people who had a large door close on their life and an even larger door open – all in the space of 2 weeks. I got to cook a healthy dinner for the family. I got to witness kindness of someone sharing a healing method and see it work. I got to work with Walter and help him with a project. I got to accept an offer to assist. I got to accept to assist. And I got to hear my son say to Walter “I’m very grateful for all that we have.” . So many blessings! So many reasons to be grateful. I take this time to agree with our son…I am grateful for all that we have. I gave him an extra big cuddle this evening. Thank you. This entry was posted in Dowoo on September 29, 2015 by Carolynn Sokil - I Do Woo; Do U?. Today was a day to reflect on yesterdays epiphanies – and relish in finding what I am passionate about. Interestingly there was a slide which stated “All things a 10 year old can do, it’s that easy.” I felt my alignment slipping further into place – solidifying my vision. Being a Master Guide during this years Master Key Experience is exciting. I feel there is a shift in my inner self. Finding what I am passionate about and where my vision wishes to guide me, helps me to position myself to guide others in finding their bliss. Am looking forward to the next 6 months journey. I am excited about finding out about others dreams and helping them to identify and reach out to their purpose, their dharma. What a great way to invest my efforts. A perfectly wonderful day! This entry was posted in Dowoo on September 27, 2015 by Carolynn Sokil - I Do Woo; Do U?.